Hello friends! I hope you’re been having a spectacular week. I’ve finally been getting out and about to enjoy some sunshine and do some pondering. I find I do my best thinking when I’m out in the woods without any distractions around and that’s exactly where I came up with the concept for this recipe. It’s inspired by the Banana Pancake recipe by Ashley over at Wheat Clean, but I’ve added my own little spin to it. Most of my family probably know that I’ve been on a real pancake kick lately what with all the pictures I keep texting them, but since I don’t typically eat any grains or dairy it can be pretty hard to find one that satisfies the craving. I also don’t like eating a ton of carbs for breakfast (or lunch or dinner), so I wanted to come up with a recipe that covered all your protein needs, gave a good dose of antioxidants, and froze well for convenience. And let me tell you, these bad boys check every box! I froze a batch to see how they would hold up after defrosting and they came out delicious. I didn’t even reheat them, just ate ‘em cold and they were still great as a grab and go snack. So if you’re someone who has pretty hectic mornings whip up a double batch on Sunday to make enough to have a couple on hand for breakfast all week! Alrighty, lets get to the good stuff and see what these pancakes are packin’! Some of our delicious ingredients! I was experimenting with whey protein this week and turns out, not for me. But if you can handle dairy then it tastes great in the pancakes! These polysaccharides include pectins—specially structured polysaccharides that in winter squash often include special chains of D-galacturonic acid called homogalacturonan. An increasing number of animal studies now show that these starch-related components in winter squash have antioxidant, anti-inflammatory, as well as anti-diabetic and insulin-regulating properties. Any of my regular readers are likely quite familiar with cinnamon and its role in blood sugar balance and cellular insulin sensitivity (my god that’s a dull sounding sentence…), but did you also know that it is chock full of nutrients that can help keep your blood flowing smooth as silk? Cinnamon contains an active component called cinnaldehyde, which prevents platelet membranes from releasing arachidonic acid (a fatty acid that plays a role in the inflammatory response in the body) thereby reducing the formation of an inflammatory messaging molecule called thromboxane. I’ve added this spice just because it’s such a great antioxidant and liver-supporting nutrient that I figured, why not? It doesn’t really have a strong flavour unless you use too much in your recipe at which point it begins to taste like dirt. Adding a teaspoon or so to most recipes won’t typically affect the flavour but can have excellent health benefits in terms of helping decrease inflammation in our bodies thanks to curcumin and increasing Phase 1 liver detoxification to keep us purring along like kittens. If you look closely you can see the bubbles starting to form, meaning it’s about time to flip! 1 tsp. fresh grated ginger for an extra kick! Add pumpkin, arrowroot starch, coconut milk, spices, protein powder, greens, maca, and Ashwagandha to the bowl with the yolks. Set aside. Using a handheld mixer, whip the egg whites until they’re firm and form stiff peaks. This means when you pull the beaters out of the mix, the whites stand up straight and tall without falling over. Once whites are firm, use handheld mixer to combine other bowl of ingredients until smooth and luscious. When finished blending ingredients, slowly and gently fold into the egg white mixture until fully combined. 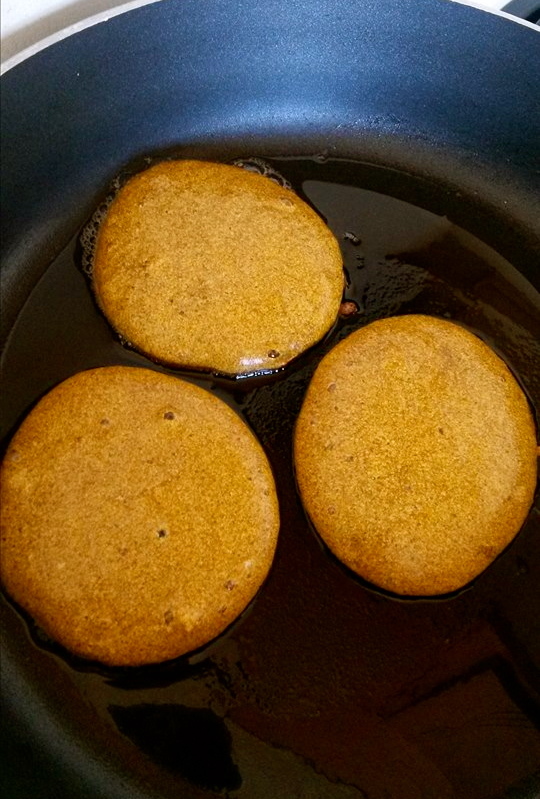 Heat a frying pan over medium heat (4-5) and add ½ tbsp. of butter or coconut oil. Once heated use ¼ cup measure to spoon out pancakes. Let cook until they start bubble, approx. 4-5 minutes. Flip over and cook another 4 minutes. 10. Remove from pan and serve! You may wish to top them with walnuts, maple syrup (only the real stuff!!! 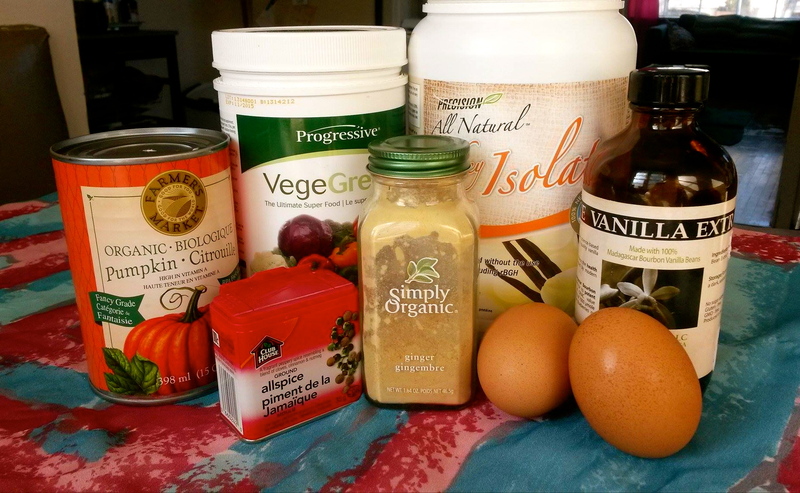 ), pecans, coconut milk whipped cream, or simply coconut oil or butter. *Sometimes I’m lazy and I leave this step out. In that case just combine eggs with all other ingredients and add 2 tsp. baking soda. The pancakes won’t be quite as fluffy, but they’ll still be delicious and jam-packed full of nutrients! So that’s all for today friends! I hope you enjoy eating these pancakes as much as I’ve enjoyed developing them (and eating all the sweet sweet test batches!). Have a wonderfully whimsical day! These look awesome. Do you have any substitutions that would work for people that need to avoid eggs? I always find it challenging to make a successful pancake sans eggs! Thanks for checking it out! 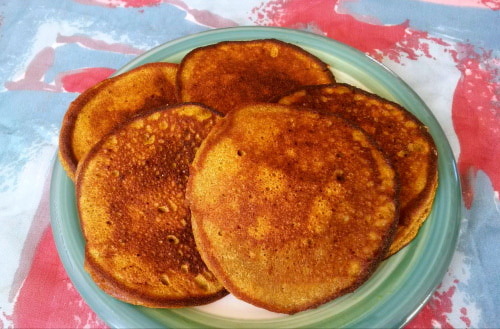 I haven’t tried making a pancake sans eggs either… it’s already so hard no using flour! I think maybe a chia egg with the arrowroot starch and a banana could work? I don’t think you’ll get the same sort of rise since the meringue is what makes them so fluffy and that’s Let me know if you find a great substitute! Also, I’ve found that people who can’t do chicken eggs tend to handle duck eggs quite well, so that would be another option to play around with. I found this recipe for a vegan meringue, but it calls for egg replacer and I’m not quite sure what that is… maybe you could adapt it?